Have you ever been away from home and couldn't find your charger? Or been going on a trip and had to bring several different charges for your different devices? I have the answer to that problem. NJSJ 4 in 1 Charger . This charger is for charging only, not to sync data. It is a real time saver, you can charge 4 devices at one time, not to mention it's a space saver too. You only need this one charger to cover all of your charging needs. It can easily be carried in your purse, briefcase, duffle bag. 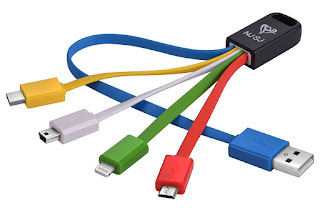 It really comes in handy for those who are always on the go, and without a cord there's no tangling issues either. I hate when my charger gets tangled up in my purse, so that's a big plus to me.